Discuss how interior and exterior folding glass doors contribute to green building goals. Name the sustainability benefits of natural daylighting and views. Describe a recent ADA-compliant feature for doors in commercial projects. Identify where glass doors can contribute to LEED points. With some 90 percent of Americans spending most of their days indoors, one of the most salutary things an architect can do for a building is to open it up to the outdoors and natural light. Whether interior or exterior, folding glass doors represent an advantage to commercial properties in several respects: They bring richness and light to a room; they maximize space by opening a room up to the outdoors, or by reconfiguring interior areas; and they increase a building's energy performance and green building quotient. Today's profiles feature maximum glass and minimal frames, enhancing these benefits while creating a clean, crisp modern look. This article will discuss available options in glass folding doors for commercial projects, and address their performance characteristics in terms of energy efficiency, impact resistance, and sustainability. Also discussed will be ways in which glass folding doors can contribute to the health, safety, and welfare of building occupants, and new options in meeting requirements of the Americans with Disabilities Act (ADA). The purpose of folding glass doors is to connect the indoors and out by eliminating walls, to admit natural daylight into a building, and to reconfigure interior space for greater efficiency and flexibility. Both interior and exterior glass folding doors have long been used for these purposes to enhance a variety of commercial spaces. Folding glass doors connect interior spaces with the outdoors. 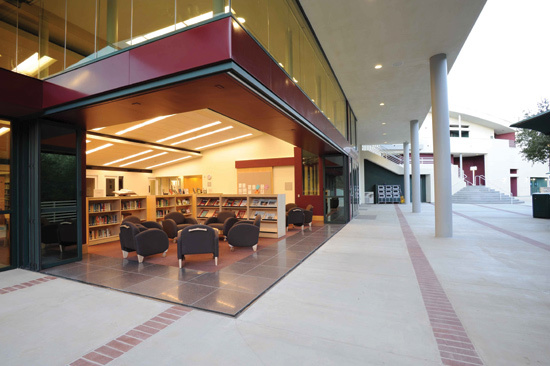 At the Viewpoint School in Calabasas, California, Kalban Architects used a zero post corner system to completely open up the Fletcher Family Library to the courtyard when desired.